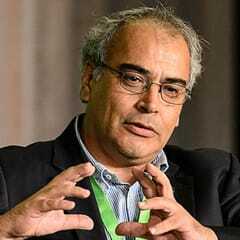 Dr Pablo Pacheco is a Principal Scientist at CIFOR based in Bogor, Indonesia. He is the Team Leader of Value Chains, Finance and Investments at CIFOR, and coordinates Flagship 5 on Global Governance, Trade and Investment under the CGIAR Program on Forests, Trees and Agroforestry (FTA). Pacheco holds a PhD in Geography from the Graduate School of Geography at Clark University, a Msc in Agricultural Economics and a BA in Sociology. His main research areas comprise the human dimensions of global environmental change, implications of trade and investment for forests and people, land and forest governance, landscape and agrarian change, regional development and land-use change in the tropics, and public-private institutional arrangements and governance systems for sustainable and inclusive value chains.